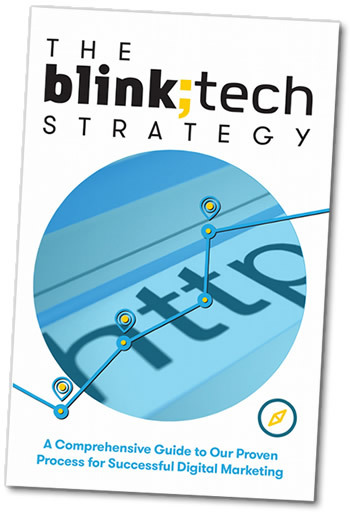 The Blink;Tech Strategy - Your FREE Guide to Digital Marketing Success! The Blink;Tech Strategy: A Comprehensive Guide to Our Proven Process for Successful Digital Marketing is a collection of our strategies, tips, and experiences working with web-centric companies like yours that rely on Internet marketing to fuel their business. Our eBook offers a firsthand look into the proven Build-Promote-Evaluate process which we follow for all our clients. While this book does contain quite a bit of knowledge, it is our hope that it will also you offer you some understanding of what is involved with developing an effective web presence and make the most of the technologies available. The Blink;Tech Strategy eBook is FREE! Simply fill out the accompanying web form and you will be given access here on our website! You will also be given a free subscription to our monthly eNewsletter. You can unsubscribe at any time. If you would like to talk to us about your own web development and/or Internet marketing needs, please call us at (941) 548-9950. Would you like us to contact you regarding a current project? Yes, please contact me. No, not at this time.